The fort was built on a hill northeast of the town, around the site of a chapel dedicated to St. John (S. Giovanni). The importance of this position as a point from which the town could be threatened by cannon fire had been recognised as early as the 16th century. 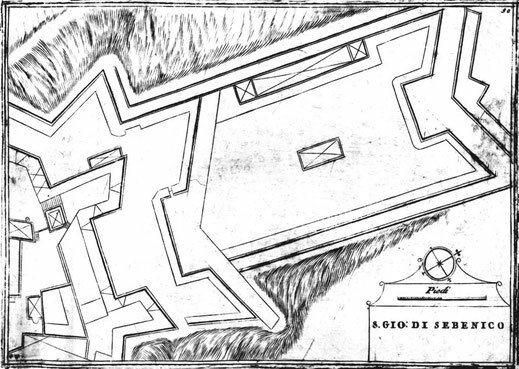 The outbreak of the War of Candia in 1645 provided the immediate motive for the erection of the fort. The construction took place in the period between 1646 and 1656, its building history being very complex. It was marked by the activity of several builders and by extensive repairs of damage due to war destruction. The fort underwent a fierce Turkish siege in 1647. At first the fort comprised a small core, which was subsequently enlarged. A little further to the north a small auxiliary fort was constructed. Later these structures were connected by straight walls, thus forming an elongated body; on the same side another rampart was added to the core. Finally the fort, as shown in Coronelli's print, contained three bodies in the form of so-called tenaglia (Ital. for pliers), arranged one in front of the other; this fortification element consists of two demi-bastions connected by a short wall. Due to the shape of the terrain in the form of an elongated plateau, the protruding tenaglia was built, situated immediately above a poorly visible valley. It is interesting to note that this feature became a synonym for the Šibenik fort, popularly referred to as the Tanaja. A less complex fort, Barone, is situated on a lower position towards the southeast. It was built at the same time and with the same purpose as S. Giovanni. 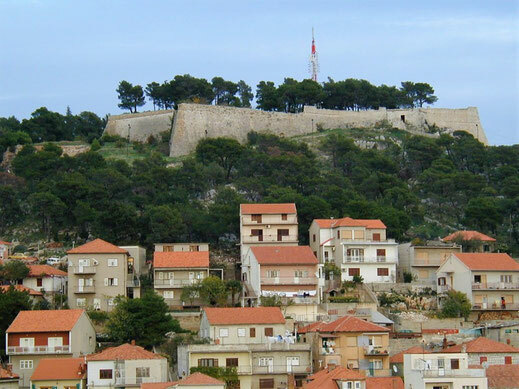 The forts were connected to each other as well as with the town by weak fortifications that have not been preserved, but at that time were linking all the positions into a large defended unity.